Cup of Medium (Approx. 3/8'') Black Soldier Fly Larvae (100 Count)-$5 Sale! Cup with mesh and original (green) chow only (no worms) suitable for either silkworms or hornworms. 3 of our most popular feeders come together in the Soft n Crunchy Snack Pack. 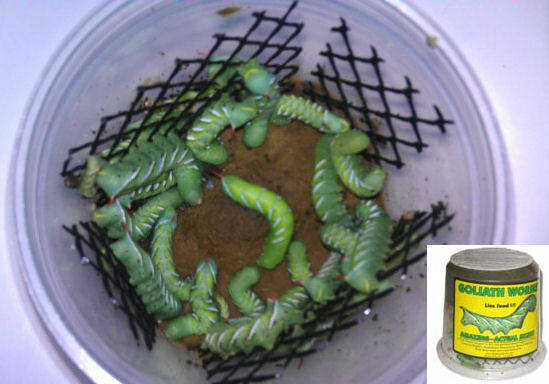 You get 50 butterworms, 1 cup of our beautiful, natural green hornworms and, for a little crunch, 250 large superworms. Variety is the spice of life for little guys with our Small Herp Snack Pack! You get 2 cups of medium black soldier fly larvae (100 ct each), 500 small super worms and 1 cup "small" size hornworms. A triple treat for small reptiles that like variety. Our Super n Hornworm Combo is perfect for reptiles who enjoy a little crunch with their caterpillars. 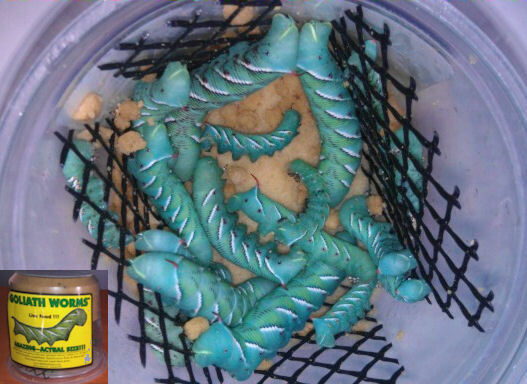 You get 2 cups of our beautiful, natural green hornworms and 250 large superworms. *Note- If you would prefer teal worms, just let us know in the shipping instructions. Our Tiny Herp combo is perfect for tiny reptiles with big appetites! You get 2 of our smallest feeders and lots of them- 2 cups of small Reptiworms (100 ct each) and 1000 of our micro super worms. PRICE INCLUDES STYROFOAM BOX & COLD/HEAT PACK AS NEEDED! 4 oz. Powdered Painted Lady Larvae Food (feeds up to 50 plus larvae). NOTE: If keeping refrigerated, eggs must be shipped via Fedex Overnight in a styro box w/ice pack (sold separately). Herps love variety and our Herp Snacker Snack Pack gives your pets the variety they crave and need to stay healthy! You get 2 cups of medium black soldier fly larvae(100 ct each), 500 medium super worms and 1 cup "medium" size hornworms. A triple treat for medium size reptiles. NOW ONLY $5 AS PART OF OUR "$5 SALE" (WHILE SUPPLIES LAST)!